By Brian BienkowskiTraces of 18 unregulated chemicals were found in drinking water from more than one-third of U.S. water utilities in a nationwide sampling, according to new, unpublished research by federal scientists. Included are 11 perfluorinated chemicals, an herbicide, two solvents, caffeine, an antibacterial compound, a metal and an antidepressant. Traces of 18 unregulated chemicals were found in drinking water from more than one-third of U.S. water utilities in a nationwide sampling, according to new, unpublished research by federal scientists. Included are 11 perfluorinated compounds, an herbicide, two solvents, caffeine, an antibacterial compound, a metal and an antidepressant. Researchers from the U.S. Geological Survey and the Environmental Protection Agency analyzed single samples of untreated and treated water from 25 U.S. utilities that voluntarily participated in the project. Twenty-one contaminants were detected – mostly in low concentrations of parts per trillion – in treated drinking water from at least nine of the utilities. 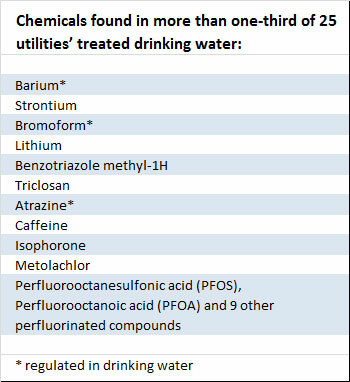 Eighteen of the chemicals are not regulated under the federal Safe Drinking Water Act so utilities do not have to meet any limit or even monitor for them. “The good news is the concentrations are generally pretty low,” said Dana Kolpin, a research hydrologist with the USGS who participated in the study. For many of the contaminants, little is known about any potential human health effects of low doses. But one of the perfluorinated compounds, known as PFOA, has been linked to a variety of health problems, including cancer, among people in communities where water is contaminated by a chemical plant in West Virginia. Of 251 chemicals, bacteria, viruses and microbes the scientists measured, 117 were not detected in any of the treated drinking water. Twenty-one were found in water from more than one-third of the 25 utilities (nine or more) and 113 were found in less than one-third (eight or fewer). EPA research chemist Susan Glassmeyer, who led the project, said the utilities, which remain anonymous, represented a mix of large and small, and used different water treatment technologies. Preliminary findings of the study, which is expected to be published next year, were presented by the scientists at a toxicology conference in Nashville last month. While studies increasingly report newly emerging contaminants in wastewater, there has been little data on which ones are in drinking water. Four of the chemicals found in the samples – the metal strontium, the herbicide metolachlor, PFOS and PFOA – are on the EPA’s list of chemicals under consideration for drinking water standards. The EPA plans to make decisions regarding at least five of the contaminants on its list next year. “We’re hoping through this work the EPA will do a much more intensive contaminant candidate list and develop new methods and requirements for drinking water plants,” said Edward Furlong, a scientist with the USGS who participated in the study. Perfluorinated chemicals, which were found most frequently, are widely used in a variety of industrial processes, including manufacture of some nonstick and stain-resistant food packaging, fabrics and cookware. The two most common perfluorinated compounds, PFOS and PFOA, in the utilities’ water have been detected in the blood of nearly all people in the United States. A panel of scientists has concluded that there is a “probable link” between PFOA in drinking water and high cholesterol, ulcerative colitis, thyroid disease, testicular cancer, kidney cancer and pregnancy-induced hypertension. The findings were based on people in Mid-Ohio Valley communities whose water was polluted with PFOA from a DuPont plant. PFOS, used in Scotchgard until 3M phased it out in 2002, has been linked to attention disorders in children and thyroid disease in men. The EPA has classified metolachlor as a possible human carcinogen based on studies of highly exposed rats. Strontium can affect bone growth, according to some animal studies that used doses much higher than those found in drinking water. The perfluorinated compounds were at similar concentrations in the untreated and treated drinking water, suggesting that treatment techniques are largely unsuccessful. Only one plant was successful at removing them, and it used activated carbon treatment. Activated carbon, ozone and UV treatments are generally better at removal than traditional chlorine treatment, but such techniques are often prohibitively expensive, Glassmeyer said. Treatment also can sometimes transform compounds into new ones, said Laurel Schaider, a research associate at the Harvard School of Public Health.